The foundations of Bangalore were laid down by the Vijayanagara chieftain Kempe Gowda. Like all things in Vijayanagara, Kempe Gowda was keenly interested in building an economically as well as culturally rich city that would ensure his legacy would be remembered for hundreds of years. This is why, during the construction of the city, special emphasis was placed on enhancing the beauty of the city and making it truly remarkable. Special water reservoirs, grandiose temples and glamorous parks were built all around the city. This also happens to be one of the reasons why Bangalore is called the Garden City. Let’s take a look at the nine most beautiful parks in Bangalore. The Cubbon Park is situated in the central administrative area of the city of Bengaluru. The park is home to the statues of famous personalities as well as rich and diverse flora and fauna. This also happens to be one of the most famous parks in Bangalore. The park is aesthetically pleasing and garners the attention of tourists and nature lovers alike. Timings: Open all the time but 5 am to 8 am has been declared silent time. One of the most prominent remnants of the Wadiyar dynasty, the Lalbagh Botanical Park pays homage to Hyder Ali who had ordered the construction of the park (however, it was his son, Tipu Sultan, who saw to its completion). The park spans over 240 acres right in the middle of Bangalore and houses over a thousand types of flora and a few endangered species of birds as well. On public holidays, the park typically hosts special events like the Lalbagh Glass House Botanical Show, a true spectacle. Cariappa Memorial Park is situated in the heart of Bangalore city as a part of the Parade Grounds on M G Road. The park is spread across 22 acres and is dedicated to the Field Marshal K M Cariappa who served in the Indian Armed Forces. The Indian Army is in charge of the maintenance of the park. The one unique offering of the park is that it provides games and a play area with a military theme. The park is divided into six parts and has attractions like waterfalls, Burma Bridges and zigzag tunnels. Jayaprakash Narayan Biodiversity Park, also known as JP Park, is situated in Mathikere in the north-west area of Bangalore. The park has a massive lawn spread across 25 acres and, to supplement the landscape, also has four lakes. The park also has a diverse variety of trees and shrubs that grow here perennially. The park also boasts a nature centre, an exhibition plaza, and an amphitheatre. Another important offering of the park is the rock garden that is modelled after the one in Almatti (also in Karnataka). This butterfly park has a trail that is over a kilometre long, and also has a butterfly garden. The park also has a polycarbonate roof and a breeding area for insects. The garden has a waterfall and a landscaped garden to create a favourable habitat for the insects. The park is home to mainly five species of butterflies: papilionidae, pieridae, nymphalidae, lycaenidae and hesperiidae. But the total number of butterfly species is 48. Although located 20 kilometres from Bangalore, Bannerghatta National Park is one of those parks that can’t be absolutely missed. The park is host to a variety of wildlife and includes various species of animals, ranging from elephants to Royal Bengal Tigers. The park also doubles as a sanctuary for elephants as well as endangered species of tiger. The ark is also blessed with a diverse fauna and is a great destination for trekkers and adventure lovers. A former prison which has been now revamped into a park, Freedom Park sits right at the centre of Bangalore. Opened to the public in 2008, it now has various amenities like a socio-cultural library, a joggers’ park and children’s play area. The park also has a special area allocated for protests to be conducted. Various high profile protests (including the one led by Anna Hazare) have taken place at this park. The park also regularly holds a light and sound show that garners a massive footfall. This park is only a stone’s throw away from Lalbagh Botanical Gardens and is one of the oldest parks in the city. 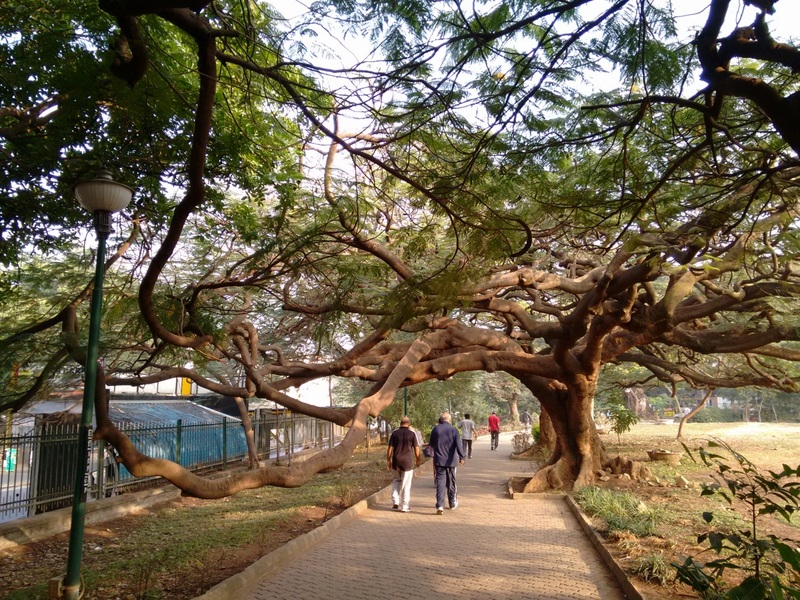 It houses some of the oldest trees seen in Bangalore and also has several canopies for the numerous visitors that come here on a daily basis. It is named after the Dewan of Mysore, who remains the park’s largest donor. The park serves as a haven to the local residents as it provides a place for those who want to invest in their daily fitness. The park also has a large association that works closely with the management for the upkeep and maintenance of the park. The Neralu Tree Festival occurs every year, during which the sanctity of the trees in the park is celebrated. Bugle Rock Park is famous for the rock that sits at the centre of the park. The rock formed here is a geological anomaly and thus attracts hundreds of scientists and geologists from all over the world. For this purpose, it has been deemed an important monument for research. There is also a watchtower that is built on the rock; it offers a 360-degree view of Bangalore city. It also has waterfalls, temples and fountains for visitors to be amazed by. Parks are a great place to begin your day with a run or a stroll or a place to unwind after a full day of work. Now that you know about the different parks in Bangalore do head out to one and let us know your experience in the comments section below.